Sophisticated in design, this elegant bed is the perfect fit in any child's bedroom. 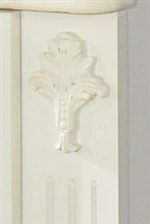 It features simple a white luminous finish to brighten up the bedroom and classic shaped molding details along its headboard and footboard. Watch your daughter sleep like a princess in this fairy tale sleigh bed. This bed is available in twin and full sizes. This matching dresser and mirror set is the perfect addition to any little girl's fantasy bedroom. It features six spacious drawers, decorative embossing and is is embellished with satin nickel hardware. By complementing it with the landscape mirror will create a more decorative and fairy tale bedroom with the mirrors soft and classic shaped crown moldings. The Exquisite 3-PC Full Bedroom by Signature Design by Ashley at Miskelly Furniture in the Jackson, Pearl, Madison, Ridgeland, Flowood Mississippi area. Product availability may vary. Contact us for the most current availability on this product.